To keep boilers and boiler room equipment operating at their peak performance and optimum efficiencies, consider opting for one of our regular and preventative routine maintenance visits. The D. B. Johnsen Company offers special "Service Contracts" ranging from semi annual, quarterly, or monthly visits, to inspect, test, adjust, clean, and repair boilers or boiler room equipment. We customize each service contract around a particular client's needs so no two contracts are exactly alike. 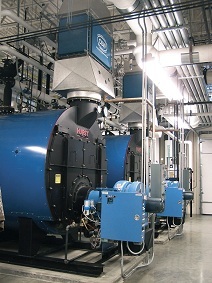 We can limit the services provided to address just the boiler or we can encompass all of the boiler room equipment. We often include routine preventative maintenance type items, combustion tuning to keep boilers operating at optimum efficiency, and annual teardowns and State of Ohio inspections to name just a few of the tasks included in our service contracts. To inquire about service contracts for your boiler and boiler room equipment, call our Service Department at 1-800-442-1242 or click here to email us.